Close to 200 people attended a public meeting Thursday outlining the progress so far on two upcoming phases of downtown riverfront development. Those in attendance Thursday heard from David Rubin, principal and founder of David Rubin Land Collective, the firm contracted to lead the second and third phases of the project. Rubin discussed his firm's vision and guiding principles with the assembled crowd before encouraging the audience to participate in a series of stations designed to hear from residents about what they'd like to see along the riverfront. “Our goal will be to establish a plan that is financially responsible and capable of being realized,” Rubin said. Attendees also heard from Mayor Tom Henry, who described Fort Wayne's rivers as a treasure and announced that Promenade Park – the focus of the project's first phase – is expected to open June 21. But that's just the start, Henry said. 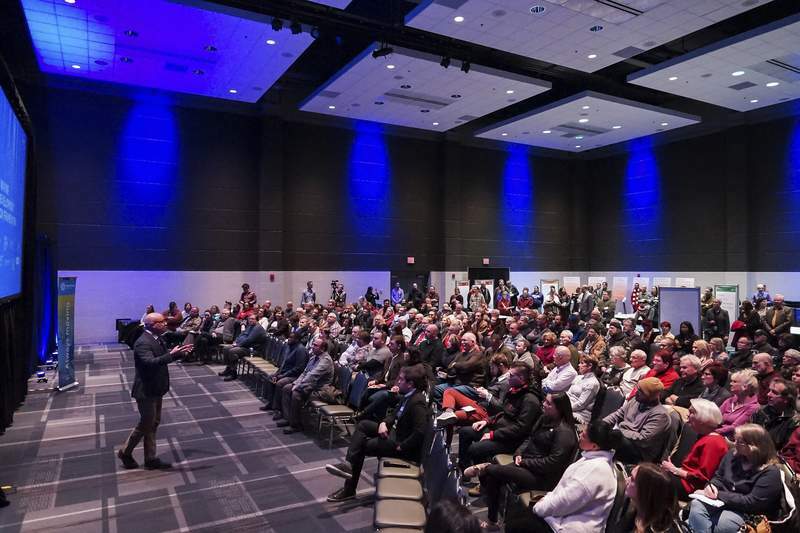 Attendees at Thursday's event came from Fort Wayne and the surrounding communities and each had different ideas for what would work best for future riverfront development. Michael Makarewich, an Auburn resident and member of the Auburn Parks Board, said he attended Thursday's meeting to gather ideas for how to develop Cedar Creek on the east side of Auburn's downtown. “I was very interested in coming here to see what's going on with Fort Wayne and the very exciting prospect, because I'm hoping for Auburn it can be a transformative process as well as in Fort Wayne,” Makarewich said. Makarewich said he hopes to replicate some of Fort Wayne's community engagement efforts in Auburn. Makarewich said he often frequents Fort Wayne's downtown to get ideas for Auburn. For Fort Wayne's riverfront, Makarewich said he hopes to see more restaurants and activities for people to exercise and play along the river.